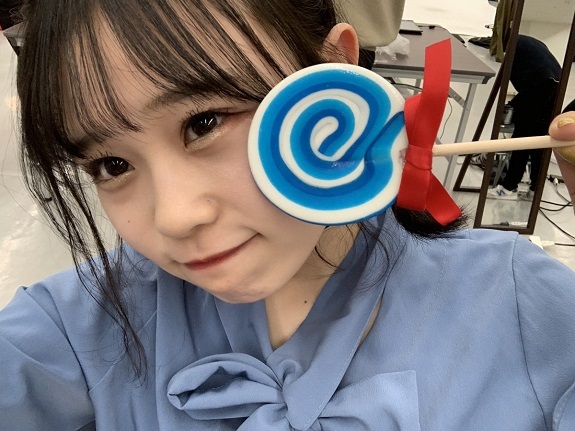 It had been almost two months since I had met with my 48-group two-top Akiyoshi and Kaotan. I was really looking forward to spending a little time with the two of them, especially since all the news about Kaotan getting married broke after that last event. In any case, I had nine tickets in total, all for members I see on a regular basis. 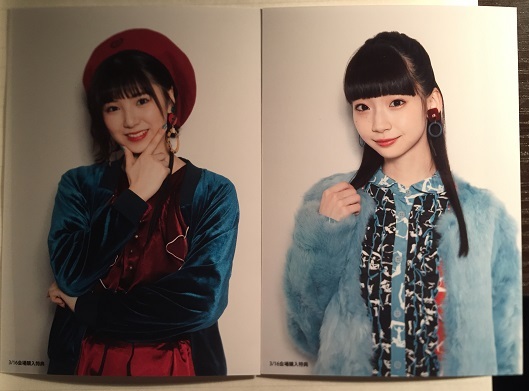 After some interesting reactions at the theater over the past month or so, I was seriously considering using a ticket to oshi-mashi for either Katsumata Saori or Sato Shiori, both 3rd gen draftees for AKB. The problem was that 1) I didn’t have a ticket I was keen to give up, and 2) The slots they were participating in were the two I had the most tickets for, so it was a question of time. Ultimately I would make the decision when I got to the event. The other news of the day was the return of NGT48 to the handshake events. I’m not sure how I feel about that, as I’m not down with a bunch of weird energy around the event. But checking the venue map, NGT and NMB’s lanes were positioned at the far left side of the halls, while pretty much all of my tickets were on the opposite side. So technically I would have no reason to go anywhere near that part of the event since I had no NGT or NMB tickets. The only tickets I had that were even remotely close to that area were for Akiyoshi, but that wouldn’t take place until the end of the day, and the NGT members whose lanes she was close to were all kenkyuusei anyway. <second ticket> This time I didn’t win, which was just as well. 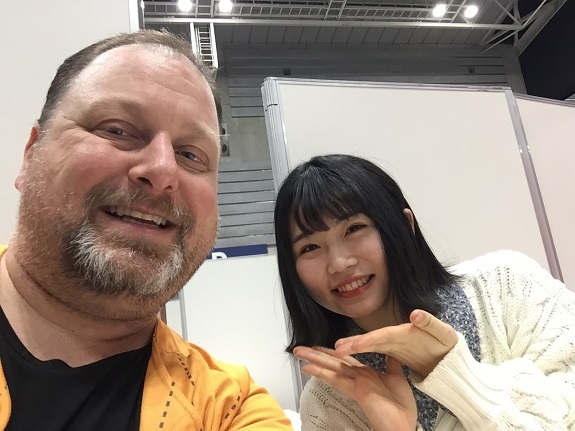 I did a 2-shot with her at the last event, and I wanted a little bit of talk-time with her after all. As I was waiting in line I noticed Katsumata around three lanes over. I decided not to oshi-mashi her lane because I have a ticket for her at the next single event, so I can talk to her then. As for Ranchan, I told her that I love going to the Pajama Drive stage since she always gives me such a great reaction at the end of the show, to which she thanked me and gave me a “Yheaahh!” for good measure. Ranchan is so adorable, and a lot of fun. My next ticket was fairly close by, but as I got close to the lane I was blocked by a bunch of security and a huge crowd. I thought “What the heck is this? Is an SKE member graduating today?” It turned out to be a birthday celebration for Matsui Jurina, and she was outside the lanes taking pics with the fan-made birthday banner. So I simply stood there and watched the proceedings from the side, which was actually a pretty good view. It wasn’t until a few minutes later that I saw another fan tell them he was trying to get into the blocked lane, and they let him through. So I followed suit, and it was perfect timing as it was just as Jurina was walking back through the lane next to me. So it was almost like I got my own private moment with her as she was waving to everyone as she walked back. I picked the “graduation’ line since she is graduating, and I am graduating from University next month. Kaotan asked what I was going to do post-graduation, and I said I need to find a full-time job. She said she wanted to talk with me more about it, and asked if I had more tickets. I told her no, but I would see her at the MetLife Dome event coming up. As I had a while until Slot 5 began, I decided to check out the CD sales table since I hadn’t yet purchased any of the non-theater editions of ‘Jiwaru Days’ yet. Per usual, they were offering an additional “mystery” bonus photo for buying the CD at the venue. There were eight members you could possible get. I wanted to buy at least one CD to get the Sasshi solo song MV, and to get Zenkoku handshake tickets. I ultimately bought two, Types A and B. And for my bonus photos I got Ogino and Sugawara. Oh, and for some reason they gave me an extra shop bonus pic, which to my pleasant surprise featured Zukki. Oh, and at this point they were showing the 17-100 Rank-in concert on the big screens. The part where Kaotan gets dumped into the flour is absolutely hilarious! Yamane Suzuha (Lane 81) I lined up early, before her queue could get too big. This was the first time ever that I have had the chance to win a member poster as a lane bonus, but I didn’t hit. I was really bummed too since Zunchan’s posters were all very nice. 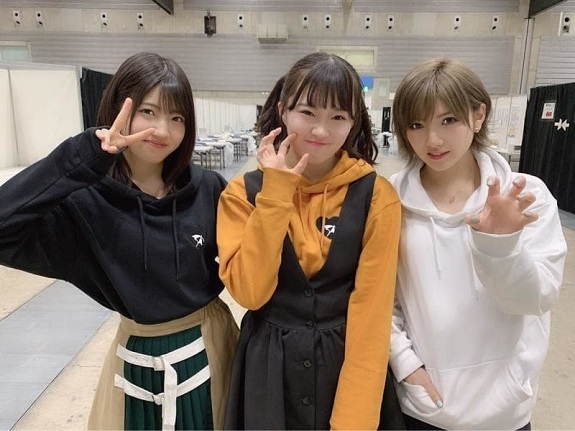 Zunchan had on a black and orange outfit, and was wearing twin-tails. She looked blindingly cute. Also, and this was new, I noticed not only were her usual signs posted all over the lane, but her stuffed frog companion ‘Gabriel-kun’ also had a sign, essentially saying that he loves humans, LOL. I took the opportunity to confirm with her that she could hear me screaming her name at the theater stage I went to a few weeks ago. 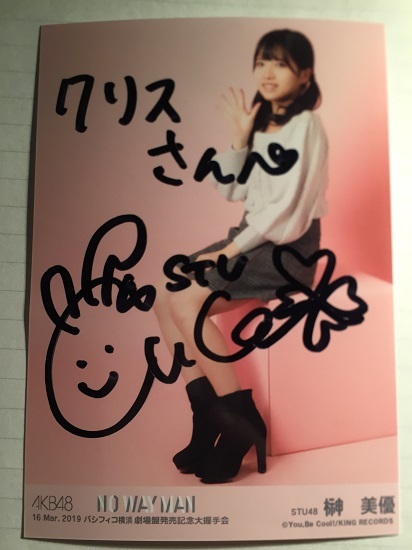 (I wrote in an AKB48 stage post how Zunchan was hand-motioning to me during the stage that she could hear my calls) She said that of course she could hear me, and thanked me for doing it. I told her I was sorry I didn’t win the poster, but maybe next time. I once again told Cuca that I enjoy her videos, and that the Hamachi Carpaccio she made a couple weeks ago looked delicious. She confirmed “My YouTube videos?” Yes. I told her that I have eaten Tako, Saba, and Sanma carpaccio before, but never hamachi. I like hamachi though, so I want to try it. She assured me it was oishii, and thanked me for watching. I decided to take a break and leave the venue for a little while. After grabbing a drink from the conbini I decided to see whose birthday cards I wanted to sign. Oh, and the table for graduation cards was quite big as well. I ended up signing birthday cards for Cuca and Hidaka Yuzuki, as well as graduation cards for Kaotan and Obata. They also had a big banner for Kaotan, but they didn’t invite me to sign it, despite me wearing Kaotan gear. I was hoping they would, except I don’t think I had ever met the guy running the table at the time. Oh well. Yamauchi Mizuki (Lane 85) This was my only slot 6 ticket. I pre-queued so I would have plenty of time to go to dinner afterward at the mall across the street. To my surprise I actually won the prize, which was a signed card. Slightly OT, but I was in the mood for non-Japanese food, and despite it being a pit overpriced, I decided to go to the Yokohama Hard Rock Cafe for a pulled pork sandwich. I ended up getting into a bit of a tiff with the manager though. On the menu it said if you ordered an entree you could get a side-salad for 400 yen, which I did. But when I got the bill it said it was 850 yen. So I complained, and asked to see the menu where I pointed out what I ordered. The guy countered with “Yeah, but this is what you received,” turning to another page on the menu. I replied “But I ordered this” (I even pointed to it when I originally ordered it) Then he was trying to argue that the salad I received was bigger (it wasn’t very big) But is that my responsibility? I don’t know what the sizes are supposed to be. The manager then walked away, but the bar manager fixed the bill for me. Genki Bibian is always genki. I asked her how it was coming with her English studies. (She had mentioned to me she was practicing on her own time) Sadly, she admitted she hadn’t been practicing very much at all lately, but she promised to get back on it. With that, I told her the short videos she posts on twitter are cute. I am always self-conscious about taking these selfies, since I screw them up at an alarming rate. I didn’t help that Yukachan started giggling as I was trying to align the pose and maintain a smile. But ultimately it came out alright. Once again, not too much time to talk. But I did get a chance to tell her that I had wanted to see her since it had been a while. 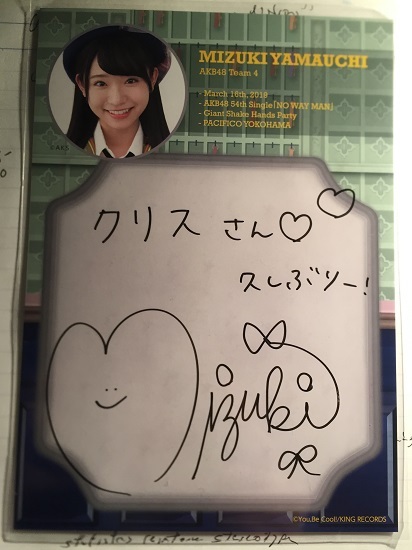 And of course I got an obligatory Yukachan “I love You” before I left. So six out of nine on the prizes. Once again, not bad eh? Although I was bummed about not winning the Zunchan poster. As for my next 48-group event, it will be the SKE48 handshake event April 6th in Saitama. Then the 48-group “Jiwaru Days” event later in April. At this point I am in a bit of a “holding pattern” with buying handshake tickets since my current visa will end in June, and I have not yet secured any assurance of an extension. So I am working on that at the moment, although it probably won’t be until May that I have that sorted out one way or another.